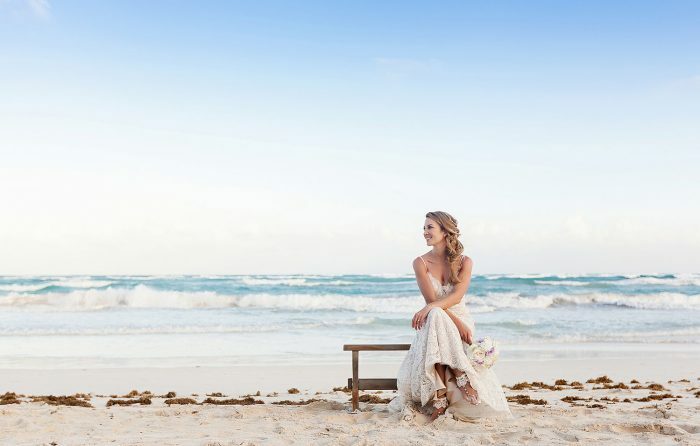 Beach Wedding Hair: Consider this when planning your wedding. 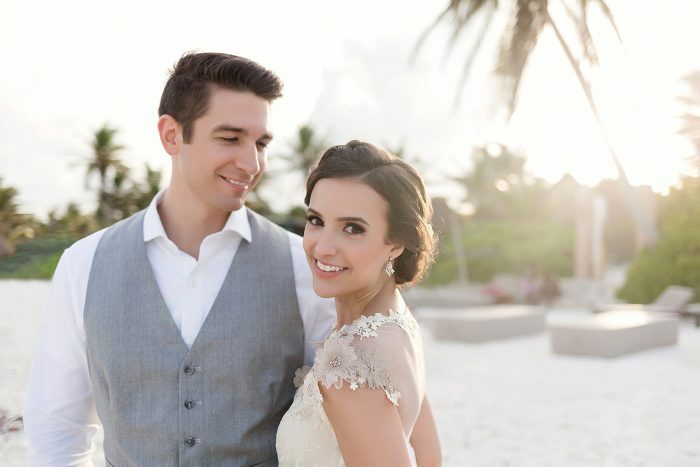 I learned really quickly photographing weddings here in the Cancun and the Riviera Maya is nearly every evening there is a beautiful breeze that comes off the ocean. This breeze is a godsend as it cools down the air and allows you and your guests to enjoy your wedding ceremony. However, if you wear your hair down, it will also blow your hair into your face and ruin your photographs if your hair is not pinned up and/or under control. This is especially important when you consider how you will stand at your wedding ceremony. Nearly all wedding ceremonies have the guests facing you with the sea as the background. The wind nearly always comes from the sea and onto land. As a result, most of the time, you are standing in the perfect position for the wind to blow your hair into you face for the entire ceremony. And if you are one of those brides that does not like wearing her hair up because you find your face looks thinner when your hair is down, not all is lost. There are a lot of styles you can choose where the hair is back or comes down one side that will still give you the volume you need to obtain that same look. All it means is you have to be creative in choosing a style. And you might want to do a test with a Stylist back home before coming down, just to make sure you are going to be happy on your wedding day. 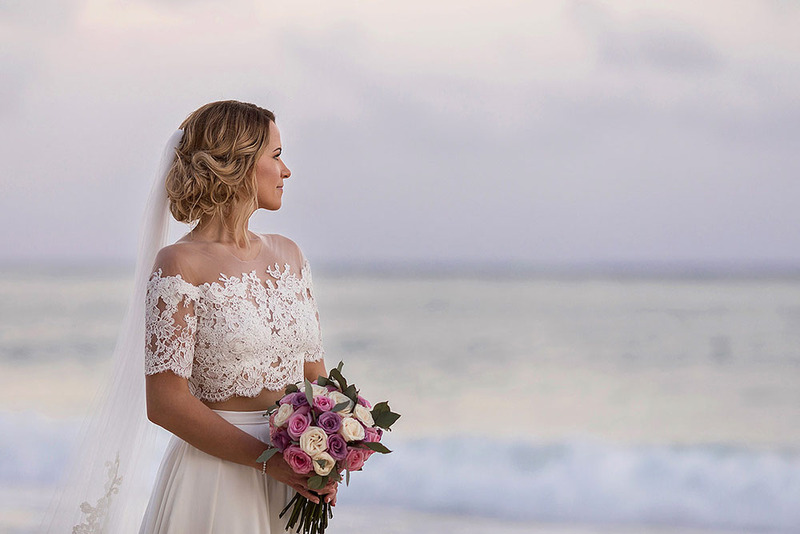 If you need some inspiration, here is a link to a Pinterest Board of images we have curated that we think are great for beach weddings here in Cancun and the Riviera Maya. Also, you might want to check out a few of my favourite styles in our portfolio section. And one bride that I think really chose the perfect hair for her face, dress and day was Rachel of Rachel and Chad. Often when I talk about hair, I get asked if it is ok to wear a veil? In my opinion, I love veils and how they flow in the wind. They tend to look great blowing in the wind. However, it is important that you pin your veil into your hair as I have seen a veil fly out of a brides hair and land 15-20 feet up in a tree as she walked down the aisle with her father. I hope you have found this little post helpful and you are a little more prepared for your wedding. Please, remember to talk to your bridesmaids about this as well because it’s equally challenging to have their hair blowing in the wind during the photo session.